You don’t have to be a serious trail runner to enjoy the backcountry views in this National Park. Acadia has 45 miles of wide, well-groomed carriage roads that are perfect for a refreshing fall run. While Acadia is known for its vistas looking out onto the Atlantic, the carriage roads tend to run through the lower elevations, where blueberry bush rises up to meet the fiery foliage. 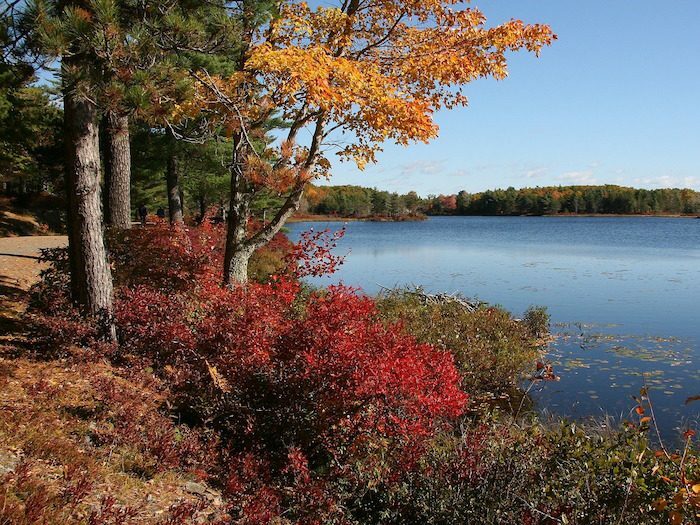 For the best views, choose a route that follows the banks of one of Acadia’s many lakes — with the leaves reflecting off the water, you’ll get double to foliage. The 3.3 mile loop around Witch Hole Pond (close to the Visitors Center) is a favorite. We also love the larger Eagle Lake. See the accompanying map for Carriage Trail Suggestions. You can also get great views by running to the top of Cadillac Mountain and sections of the Park Loop Road. See our complete Acadia National Park guide.